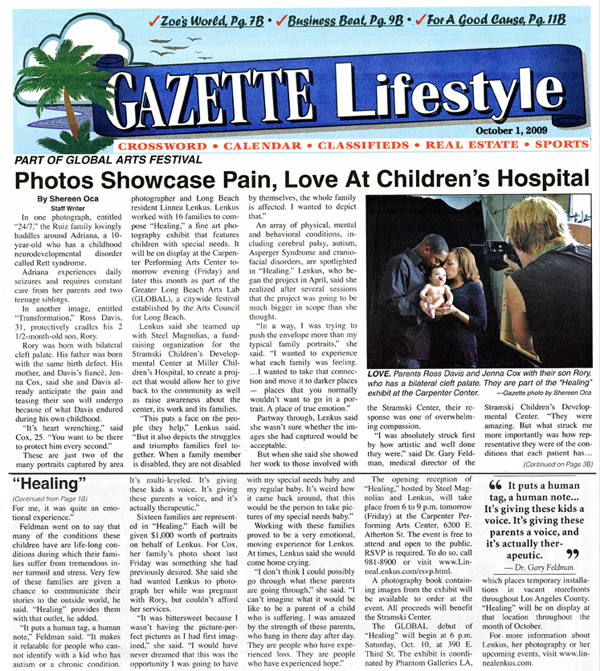 Linnea Lenkus, a photographer in Long Beach, was featured in this article in the Long Beach newspaper Grunion Gazette. Linnea Lenkus, a Photographer in Long Beach was Featured in the Long Beach Newspaper Grunion Gazette. In one photograph, entitled “24/7,” the Ruiz family lovingly huddles around Adriana, a 10-year-old who has a childhood neurodevelopmental disorder called Rett syndrome. Adriana experiences daily seizures and requires constant care from her siblings. In another image, entitled “Transformation,” Ross Davis, 31, protectively cradles his 2-1/2 month-old son, Rory. Rory was born with bilateral cleft palate. His father was born with the same birth defect. His mother, and Davis’s fiance, Jenna cox, said she and Davis already anticipate the pain and teasing their son will undergo because of what Davis endured during his own childhood. The are just two of the many portraits captured by area photographer and Long Beach resident Linnea Lenkus. Lenkus worked with 16 families to compose “Healing,” a fine art photography exhibit that features children with special needs. It will be on display at the Carpenter Performing Arts Center tomorrow evening (Friday) and later this month as part of the Greater Long Beach Arts Lab (GLOBAL), a citywide festival established by the Arts Council for Long Beach. Lenkus said she teamed up with Steel Magnolias, a fundraising organization for the Stramski Children’s Developmental Center at Miller Children’s Hospital, to create a project that would allow her to give back to the community as well as raise awareness about the center, its work and its families. An array of physical, mental and behavioral conditions, including cerebral palsy, autism, Asperger Syndrome and craniofacial disorders, are spotlighted in “Healing,” Lenkus, who began the project in April, said she realized after several sessions that the project was going to be much bigger in scope than she thought. Partway through, Lenkus said she wasn’t sure whether the images she had captured would be acceptable. But when she showed her work to those involved with the Stramski Center, their response was one of overwhelming compassion. “I was absolutely struck first by how artistic and well done they were,” said Dr. Gary Feldman, medical director of the Stramski Children’s Developmental Center. “They were amazing. But what struck me more importantly was how representative they were of the conditions that each patient has. For me, it was quite an emotional experience. Feldman went on to say that many of the conditions these children have are life-long conditions during which their families suffer from tremendous inner turmoil and stress. Very few of these families are given a chance to communicate their stories to the outside world, he said “Healing” provides them with that outlet, he added. It puts a human tag, a human note,” Feldman said. “It makes it relatable for people who cannot identify with a kid who has autism or a chronic condition. It’s multi-leveled. It’s giving these parents a voice, and it’s actually therapeutic. Sixteen families are represented in “Healing.” Each will be given $1,000 worth of portraits on behalf of Lenkus. For Cox, her family’s photo shoot last Friday was something that she had previously had desired. She said she had wanted Lenkus to photograph her while she was pregnant with Rory, but couldn’t afford her services. Working with these families proved to be a very emotional, moving experience for Lenkus. At times, Lenkus said she would come home crying. The opening reception of “Healing,” hosted by Steel Magnolias and Lenkus, will take place from 6 to 9 p.m. tomorrow (Friday) at the Carpenter Performing Arts Center, 6200 E. Atherton St. The event is free to attend and open to the public. RSVP is required. A photography book containing images from the exhibit will be available to order at the event. All proceeds will benefit the Stramski Center. The GLOBAL debut of “Healing” will begin at 6 p.m. Saturday, Oct. 10, at 390 E. Third St. The exhibit is coordinated by Phantom Galleries LA, which places temporary installations in vacant storefronts throughout Los Angeles County. “Healing” will be on display at that location throughout the month of October.